JONES FAMILY DEMANDED JUSTICE APRIL 23, 2012 OUTSIDE FRANK MURPHY HALL. DETROIT — Attorneys for Aiyana Stanley-Jones’ father Charles Jones and Chauncey Owens called Wayne County Circuit Court Judge Richard Skutt’s exclusion of a hearsay statement by “jail-house snitch” Jay Schlenkerman in Jones’ case a victory May 11. Both Weiss and Owens’ attorney David Cripps called Skutt’s ruling “courageous,” one that many other judges would not have made due to pressure from the daily media. Judge Skutt ruled that 36th District Court Judge E. Lynise Bryant-Weekes had “abused her discretion” by allowing the statement to come in against Jones. He denied Weiss’ motion to quash a charge of first-degree murder, brought by Wayne County Prosecutor Kym Worthy in October, 2011, which alleged that Jones gave a gun to Owens to kill Je’Rean Blake, 17, in May, 2010. 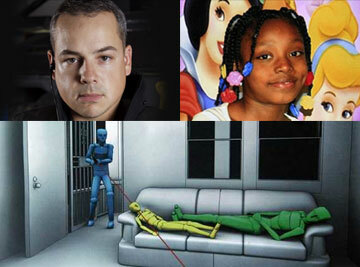 Killer cop Joseph Weekley shot 7-year-old Aiyana Jones, allegedly as depicted in expert's drawing, on May 16, 2010. Two days later after the Blake killing, a Detroit police “Special Response Team” stormed the Jones home and shot 7-year-old Aiyana to death on May 16, 2010, causing international outrage. 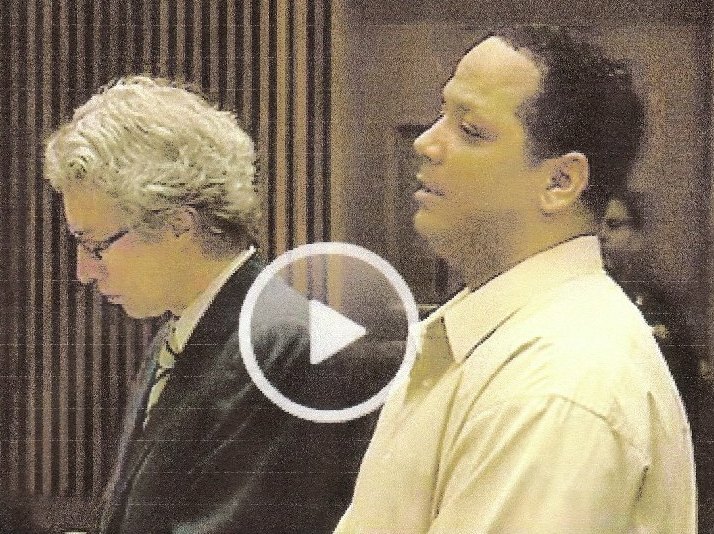 A grand jury composed of Wayne County Circuit Court Judge Timothy Kenny indicted Detroit cop and Grosse Pointe Park resident Joseph Weekley, who shot her, only on manslaughter charges, at the time Jones was charges. Weekley is free on bond. 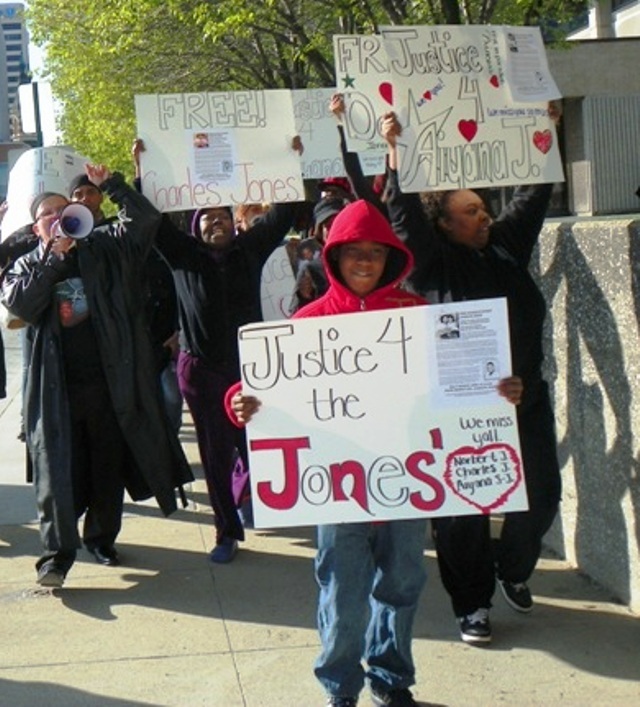 “We’re happy,” said Jones’ mother Mertilla Jones (seen in photo at top with ‘Free Charles Jones’ sign) after the hearing. “We just want Charles home to be with the rest of his family, including his six little boys.” Judge Skutt refused to release Jones on tether, but said he would be open to considering such a release in the future. Judge Skutt also ruled that two juries would hear evidence in a joint Owens-Jones trial, which was postponed until September 16, 2012. The Jones jury will not hear Schlenkerman’s testimony that Owens allegedly told him the details of Blake’s killing, implicating Jones, which Skutt said could come in against Owens. Assistant Prosecutor David Moran claimed there was still enough evidence to hold Jones, citing the testimony of eyewitness Amber Holloway at the exam. Moran said she testified that she saw Owens and Jones exit their vehicle and approach Blake together. 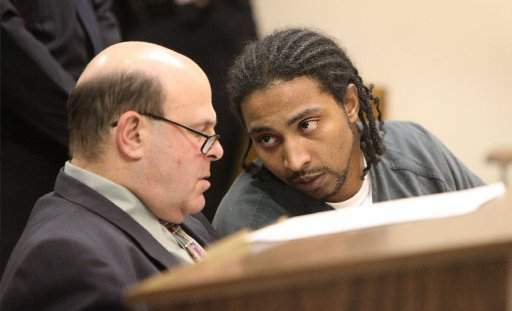 Chauncey Owens (with attorney David Cripps) earlier pled guilty to second-degree murder during hearing April 11, 2011; prosecutor reinstated charge of first-degree murder after he refused to testify against Charles Jones. Afterwards, Weiss said Moran misrepresented her testimony. Holloway, who said she was in the car with Blake when they went to a liquor store on St. Jean and Mack, also testified that she did not recognize Jones until after she saw him on TV. She said Jones was in the vehicle, but never said she saw the shooting or saw Jones give a gun to Owens, or the pair approaching Blake. 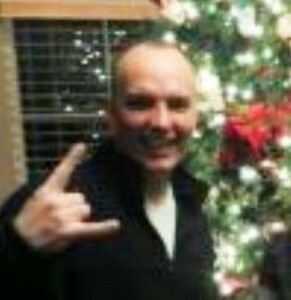 Schlenkerman celebrating Christmas after he gave statement to prosecutors in November, 3011. Schlenkerman is a six-time felon who was serving six months, reduced from one year, for a vicious three-day assault on his ex-girl-friend in May, 2011. According to medical records, the assault caused a closed head injury and other severe trauma, including sexual abuse. The Brownstown Township police originally sought felony charges including kidnapping against Schlenkerman, but the Wayne County Prosecutor reduced the charges to misdemeanor domestic violence. 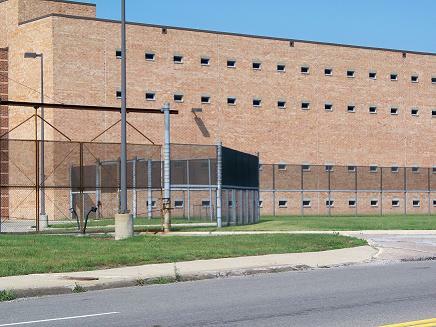 Later, Schlenkerman faced eight charges of violating a Personal Protection Order for contacting the victim while he was incarcerated in the Wayne County Dickerson jail. The prosecutor dropped five of those charges in October, 2011. Schlenkerman was released on probation in November. He promptly gave a written statement to prosecutors about Owens’ alleged statements to him. He said he met Owens at Dickerson in October and had repeated conversations with him during which, after questioning by Schlenkerman, Owens essentially “spilled his guts” and said Jones gave him the gun used to kill Blake. The two had never previously met. After oral arguments by Weiss, Cripps and Moran, Judge Skutt said he had thoroughly reviewed all the cases cited in their briefs. 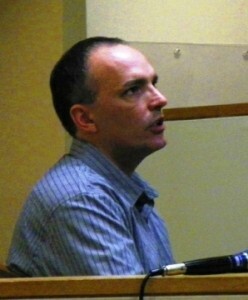 Moran argued that the Schlenkerman’s hearsay statement should be allowed under Michigan Rule of Evidence (MRE) 804B and a 2008 Michigan Supreme Court (MSC) decision in People v. Taylor, among others. He said Taylor invalidated a 1993 MSC decision in People v. Poole, which held that both MRE 804B and the Confrontation Clause of the U.S. Constitution applied. In Taylor, the Court ruled that the Confrontation Clause (the defendant’s right to confront a witness) did not apply in that situation, where co-defendants implicated each other in a murder case. 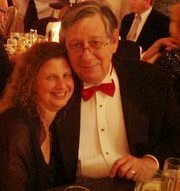 He said Taylor left in place requirements that to be admissible, a hearsay statement must be a narrative, made by the declarant without prompting or urging, and wholly against the declarant’s interest. Citing the transcript of the preliminary exam where Schlenkerman testified, Judge Skutt said Schlenkerman testified that Owens made his alleged statements to him from the beginning of October through Schlenkerman’s release on Nov. 16, 2011, “in bits and pieces” almost every day, and on questioning by Schlenkerman. “The only way I can read that exchange is that the statement was not a narrative uttered spontaneously without prompting or inquiry, with more than just the indication that the individual was curious about why [Owens] watched Fox2 News, but that he was also curious about why [Owens] was there,” Judge Skutt said. Prosecutor Moran later asked Judge Skutt to admit Schlenkerman’s statement against Owens himself. Skutt agreed to do so, Cripps said he will still ask for the exclusion of the statement against his client in a pre-trial hearing. 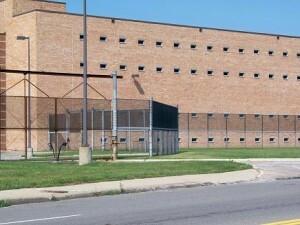 Wayne County Prosecutor Kym Worthy’s chief communications officer Maria Miller told the Detroit News that they plan to appeal Skutt’s ruling.